Don’t forget to thank the person who nominated/ tagged you. Most visits come from WP Reader. 2.Name a musical instrument/s you play/played. The only instrument I remember playing was the recorder in school many, many years ago! Unfortunately I am not musically talented….don’t even attempt to get me to sing!!! To live in a world where there is complete peace and no poverty! 5.Name a very special moment in your life. The birth of my two children would have to be the two most special moments of my life. I enjoy reading and cooking. Always write about what you are passionate about, it is always reflected and portrayed through your writing. That’s hard. I really enjoy both equally. My post on Lourdes, France would have to be my best post. You can read it here. What is the best thing about blogging and why? Do you collect anything when travelling? What is your favourite blog post you have written? Leave a link. A famous person you would like to share a meal with? What was the last flight you were on and where were you flying?? Definitely, the book thief, though the film nearly had me in tears!! The Kite Runner is my favorite book too, so so sad though. The saddest book I have ever read, indeed. I know right. I need a whole box of tissues. Did you watch the movie?? I enjoyed reading The Girl with the Pearl Earring too. I haven’t read the others, but I’ll look them up. 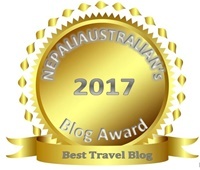 Thank you for including me in this list of wonderful bloggers. Thanks so much for the nomination Lorelle. It’s so nice to read more about you from this award. I gave up reading the Book Thief (lazy me), watched the movie instead. I’m glad you chose your blog on Lourdes. That truly moved me. I’m loving your page and travels, they’re awesome! I haven’t read any of your favorite books but I’ve always been wanting to read The Book Thief. 🙂 And I agree with your answer on #9. Always write about what you’re passionate about! Some very interesting answers! Those books sound pretty interesting, will be sure to check them out! As for baking and cooking, I can’t decide either, their both amazing and super fun! It was fun reading this post and knowing more about you! Congrats on the award Lorelle! 🙂 Lovely to get to know you better. You have a great blog, and I’m so glad you’re here writing and expressing yourself. Love, Debbie ps – I played the recorder as well!